Beaded necklace patterns like this Plaited Spiral Graduated Necklace from Bead&Button Magazine are lovely accessories for special occasions. 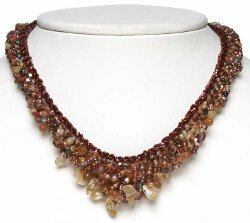 Make a beaded necklace like this to go with your little black dress or as an impressive gift for friends and family. On a comfortable length of thread, attach a stop bead, leaving a 12-in. (30 cm) tail, and pick up two color A 4 mm fire-polished beads. Pick up an A 4 mm and 11 beads from the bead soup mix, using primarily seed beads and 3–4 mm beads. Sew through the last three A 4 mms again, and flip the bead soup loop to the left (figure 1). Pick up nine 11/0 cylinder beads, sew through the last two A 4 mms again, and flip the cylinder loop to the right (figure 2). Repeat steps 2 and 3 (figure 3) until the rope measures 5 in. (13 cm) long, ending and adding thread as needed. 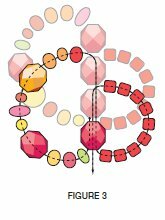 Continue working in double-spiral rope, as in steps 2 and 3, but pick up 12 beads from the bead soup mix instead of 11 for 1 in. (2.5 cm). 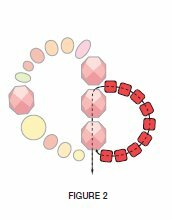 Continue gradually increasing the number of beads in each bead soup loop, and the sizes of the beads used, picking up 13–14 beads for ½–3⁄4 in. (1.3–1.9 cm), then 15–16 beads for the next ½–3⁄4 in. (1.3–1.9 cm), until the rope is 7–71⁄2 in. (18–19.1 cm) long. Continue working in double-spiral rope, but gradually decrease the size of the bead soup loops to mirror the first half of the necklace: Work about ½–3⁄4 in. (1.3–1.9 cm) with 15–16-bead loops, ½–3⁄4 in. (1.3–1.9 cm) with 13–14-bead loops, 1 in. (2.5 cm) with 12-bead loops using the smaller beads, and 5 in. (13 cm) with 11-bead loops. Set the rope aside. To make a toggle bar, pick up 20 cylinder beads on 1 yd. (.9 m) of thread. Work four rows of two-drop peyote stitch for a total of six rows, and zip up the edges to form a tube. End the working thread and tail. Using the working thread from the rope, pick up an A 4 mm and a seed bead, and sew through a cylinder at the center of the toggle bar. Sew through the beads in the toggle bar to exit the center cylinder, and sew back through the seed bead and A 4 mm and into the necklace. Retrace the thread path several times to secure the connection, and end the thread. Using the tail, pick up an A 4 mm, three 8/0 seed beads, a 4 mm, two 8/0s, a 4 mm, two 8/0s, a 4 mm, and three 8/0s. Sew back through the first A 4 mm picked up in this step, and into the beadwork. Retrace the thread path through the loop a few times, and end the tail. I have not made this project because I can't find any instructions for placing the 10mm beads. Has something been left out?